Infiniti vehicles are a luxury asset, and Mike’s Auto Service can help you keep it that way. 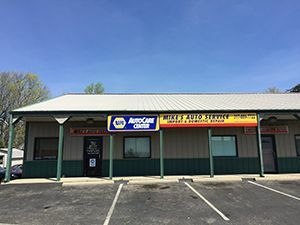 Whether you own an Infiniti G35 or Infiniti SUV, our NAPA® authorized auto care center is fully-equipped to provide Infiniti service and repair for all models in Greenwood, Indiana. We are ASE certified technicians with more than 30 years of experience, so you can trust that your Infiniti is in good hands. We don’t just want to get you back on the road quickly, we want to do it safely as well! We use a concentrated approach to identify problems and solve them properly, the first time around. This not only ensures your Infiniti car or truck is set for reliability, it is also set for safety. And to ensure quality with every service,we use all NAPA® and OEM auto parts. We offer a wide range of auto repair services for any year and model Infiniti, including scheduled car maintenance, minor repairs, major repairs, towing, and more. As soon as you suspect there may be an issue with your Infiniti, don’t hesitate to have it checked. The sooner our certified mechanics can inspect your vehicle, the better the chances of catching a small problem before it turns into a large and costly one. We take the time to listen to our clients, which allows us the chance to better meet their needs and prevent future costly breakdowns. Call us today at 317-889-7722 to request a quote, and ask about our new customer discounts too!